Artist, Lisa Bryan aka Bryan-Day - born in England and raised in B.C. 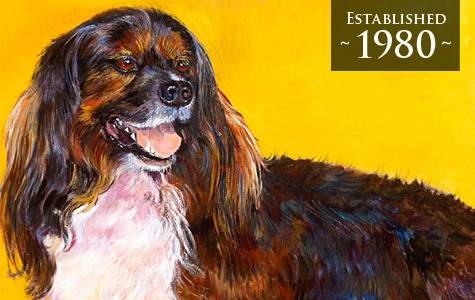 Canada, and now has lived in Carmel over thirty years, has been an ardent equestrian and dog painter all of her life. Her genre now includes wine scenes and ‘village-scape’ homes and and any variety of subjects working comfortably with oils, watercolors and mixed media. 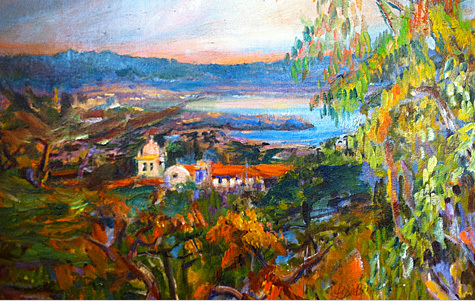 Lisa has captured, for the pleasure of many visitors, charming impressions of Carmel-by-the-Sea and its environment. Lisa self-published a local best seller in 1997, “Sketches of Carmel” and a calendar book “Carmel a Treasure” in 2004 and six, complex, stunning Poster Maps. Now working on the third edition of Carmel‘s first and only pictoral, souvenir map, the “Carmel Treasure Map” (seen everywhere around town). Lisa’s Studio is at Court of the Fountains, Mission Street between Ocean Avenue and Seventh.